MOSCOW, April 6. /TASS/. 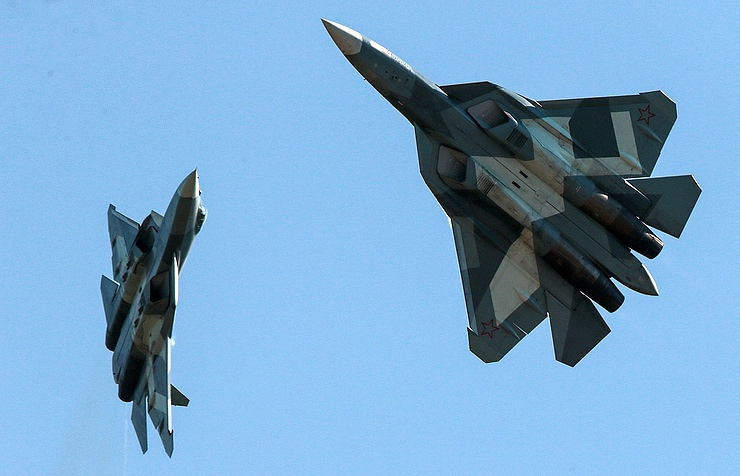 A pair of Russia’s cutting-edge Su-57 fighter jets will fly for the first time over Moscow’s Red Square during the Victory Parade on May 9, the Defense Ministry announced on Friday. "This year, the military parade will involve 73 crews of tactical, long-range, military transport and army aviation… Two Su-57 planes will take part in the parade," the ministry said. Apart from the 5th-generation fighter jets, strategic Tu-160 and Tu-95MS missile-carrying aircraft, Tu-22M3 long-range bombers, Il-78 aerial refueling tankers and Il-76MD military transport planes will fly over Moscow’s Red Square on Victory Day. The parade flight formation will include Mi-26, Mi-8, Mi-28N, Ka-52 and Mi-35 helicopters, Su-35S, Su-30SM. MiG-29 and MiG-31BM fighter jets, Su-34 and Su-24M bombers while Su-25 attack aircraft will traditionally emit the smoke in the colors of the Russian flag. As Russia’s Defense Ministry said, all the Aerospace Force’s crews involved in the parade had redeployed by Friday from the places of their permanent basing to operational aerodromes. Combat aircraft will take off from eight airfields in the Moscow, Tver, Saratov, Kaluga, Voronezh, Lipetsk and Nizhny Novgorod Regions to fly to the Victory Parade. "Army aviation crews will fly at an altitude of 150 meters and at a speed of 200 km per hour. The crews of tactical, long-range and military transport aircraft will fly at an altitude of 300 to 500 meters at a speed of up to 600 km per hour," the Defense Ministry of Russia said. As was reported in August 2017, Russia’s PAK FA fifth-generation fighter jet received the serial index of Su-57. The cutting-edge fighter performed its first flight with a new engine on December 5, 2017.